Every year at this time, thousands of cruisers head north out of Florida to the northeast to not only escape the heat but to get out of the hurricane belt. I will be leaving St Augustine tomorrow morning after a very nice stay here which included a trip down under to my sister's wedding in Sydney. 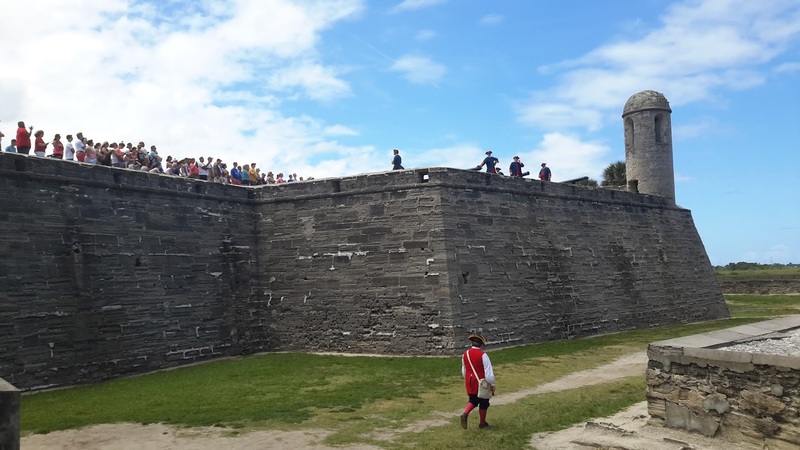 I wish that I could say that this photo shows a crowd seeing me off from Castillo de San Marcos but they are there to witness the daily firing of the cannons over the Matanzas River here in St Augustine. I always get butterflies in my stomach, the day before I leave on a 4 day sail, but the boat is as ship shape as can be with my Epirb, VHS with DSC and a good forecast. In St. Simons Island thru Thursday 6.4.15 Let me know if you are nearby.